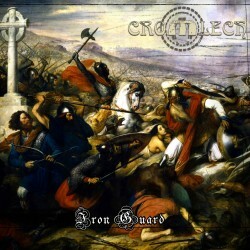 The MCD Iron Guard gathers four tracks of epic, conquering Heavy Metal with an imperious Doom approach. A massive aspect that reveals folk melodies and haunting male choirs. Shivering parts that won't let you insensitive, especially if you're into bands like Solstice, Atlantean Kodex, Bathory, Manilla Road, and even the Graveland of "Thousand Swords" !